Sorry for a double post today, but the first response to the fan challenge has been really good. Thank you for comments and tweets so far, as well as a reblog courtesy of Servetus. Servetus has also offered her blog for guest posts – what a great idea. So if you are a reader without blog but would like to dip your toe into blogging, here is the perfect opportunity and space to do so. I am also thinking, how cool would it be if the whole Fan A to Z were to be answered by 26 different guest bloggers? That’s just my idea of fun and might not suit Serv, by the way, so take it merely as me thinking aloud. A – If you added up all the money you have spent on DVDs, cinema tickets, flights, accommodation, theatre tickets, fan art, audio books etc, how expensive has RA been so far? Ugh. In German we say that money is not a topic that should be discussed. Ok, that’s a stupid cop out, given that *I* myself came up with this question. The truth of the matter is that I rarely think about money as such – or regret sinking money into something that I love or enjoy. Hence I do not really keep track of my outgoings – it’s a given that they were worth it. So I had to do a quick expenditure overview. These are basically ball park figures, but it turns out I have sunk about 2100 Euro (2500$) into this sweet hobby of mine over the last seven years. 😱? or 🤪? Does my night in Gisborne, NZ, count as extra expenditure? I’ve basically attended four events abroad that accrued flight costs of about 950 Euro. Accommodation thankfully was mostly covered by sponging off visiting friends except for one trip to Leeds. A massive 400 Euro has gone into theatre tickets. TC was an expensive run – at least when you want to sit in decent seats – as was LLL. Cinema has been much less costly at a two-figure sum – in this regard it comes as an advantage that many Armitage vehicles never turned up on the actual silver screen. Fan art is the third most expensive item on my list. I reckon I have spent about 200 Euro over the years for plushies, bags and bits and pieces over the years. (I am not calculating my own outlays for my own fan art, btw – I have totally lost track of all the postage, the printed fabrics, the postcards, the bling and tins.) Another three-figure post is my annual WordPress subscription of 99 Euro (now the second year running). Subscriptions to Audible and Stitcher have been relatively modest so far (and Stitcher has already been cancelled again), I have bought a couple of Hobbit DVD sets, so I am calculating 100 Euro for that and for sundries. So altogether more than 2000 Euro. It’s the sort of sum that will look ludicrous when looked at in isolation. But here’s the thing: The costs accumulated over a 6 year period, so we are effectively talking 350 Euro per year, or about 30 Euro per month. That’s the kind of money that other people spend on going out for dinners and drinks every week. These were expenditures that have either given me invaluable memories or tangible products that I both greatly enjoy having. In truth, I think that the gains from my investments are actually priceless. There are no price tags on friendship, on moments of joy, on happy giggles, on unforgettable theatre experiences, precious encounters at the SD, on entertainment when needed. And if there were, then 2100 Euro was a steal! I regret nothing! At the same time, I also don’t believe that our individual “standing” as a fan (if there is such a thing as a fan ranking) depends on the money we have ploughed into our hobby. Being a “real” fan does not mean that you have to fly to every event, to buy fan items or to donate money to the causes championed by our hero. I’ve spent money because – well, frankly, because I was able to do so. If I wasn’t, I’d be a fan within my own financial means, doing my thing with the resources that are my disposal for free. What about you? Care to disclose a ballpark figure? Responding to A and a tiny bit of J as well! Not sure how much I have actually spent in total in monetary terms, or even in time, but I can remember an occasion when it was ( with hindsight) probably not enough. It was when The Crucible was on at the Old Vic in London in 2014 and I had just started University as a (mature) student. I was walking back to Waterloo Station and saw the posters outside the Old Vic. To begin with I didn’t even recognise Mr. A with the beard, but I really wanted to see the play anyway so I went home and put out a message to my friends asking who would like to come to see it with me. I ended up having to buy 8 tickets and went on line, only to find that the stalls seats were £85 each. As I was a student with a cash flow issue, 8 x £85 was a bill too far for my bank manager. I knew my friends would stump up their share, but I needed to book, so I went for the Circle seats at £55 instead. Irrespective of our seating arrangements, we were all totally immersed in the action, gasping when they came to arrest Elizabeth, and then I think I spent more or less the rest of the play just sobbing, as were my friends, even the blokes. I could barely see by the time we got to the “I have given you my soul, leave me my name” line. When we left the theatre after the play, completely emotionally wrung out, I had the idea that I would go back, probably on my own, and get one of those stalls seats. Sadly, it was near the end of the run and word had gone round about how brilliant it was, so there was no chance of me doing so, it was sold out, but a marvellous experience nonetheless and one I will remember for a very long time. I know it is on Digital Theatre and there are rumours of it being replayed and re-filmed, but I still regret not getting one of those stalls seats. Oh, I love the way you have told this story, Tiny! It’s almost as if I was there with you. Well, in a way, I was – saw the play three times, and without rubbing it in – always from the very near the front (one time I was in the front row, but to the side). It was just as you surmised – in those seats, the audience felt as if they were part of the drama, members of the Salem community that didn’t raise their voices (especially in the court scenes). It was aggravating and made me feel ashamed, to a certain degree. So the Crucible tickets are a massive item on my list that I do not regret in the slightest. This is a great story. Thanks for sharing it. My answer is: more than you, lol! The question for me is always “is this something I can really afford?” That’s the only boundary for me. i would only be concerned if I were spending money I couldn’t afford to spend on it. I didn’t see it – did you include the AHA gathering in your tally? My best guess is around $1900. Probably a little more, I just can’t remember everything. Since I live in New York where a few events have happened, and since there’s no charge to stand in the street for a movie “premiere” (rolls eyes), my expenses were modest — a movie ticket and DVD here and there — until Love Love Love rolled into town, when I bought, um, more than a few seats. I justified it to myself at the time as that year’s “staycation,” and I still couldn’t imagine buying an airline ticket to do something, though I was envious of those fans reporting from London during The Crucible. My mind changed based on 1. Watching RA live. 2. Meeting for drinks/meals/touring New York with fans who had moved heaven and earth to get there. So much fun!!! Who can resist bookish women who, like me, think that going to the New York Public Library is an “event?” A library! One of the most contented half-hours of my life to date was spent sitting with Frenz in Times Square at midnight chatting with other tourists. I love what this fandom has brought to my life, and I want more. So I hooked myself up with some powerful credit cards and now have points at the ready for booking flights. Next production in London: I’m there. Mes premiers achats furent les 2 versions DVD de N and S (anglais version longue VL et français VC courte) puis les 3 DVD VL du Hobbit. Puis ce fut la poupée officiellle WB en tissus de Thorin 🙂 🙂 🙂 décrite par Servetus sur son blog. Le voyage aller- retour en train pour voir “The Crucible” à Strasbourg en Cinelive ‎(distance 562km, les 3 nuits d’hôtel, la mythique choucroute alsacienne…). Puis l’argent perdu avec Digital Theater ( la seule dépense que je regrette). Le voyage à NY en famille pour LLL en live 🙂 🙂 🙂 . Une semaine de vacances à 4, y compris l’hébergement airbnb, les billets, les musées, le total devrait être énorme. 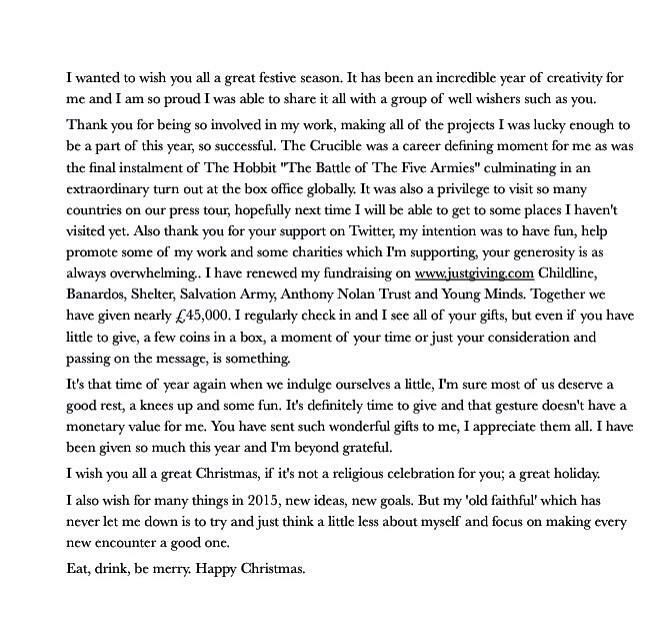 Restent les dons annuels aux associations, lors des anniversaires de Richard Armitage. I don’t like merchandising, I don’t need photo or autograph, anything I need is see him act. So sometimes I find the whole show business a little frustrating. My english is too poor for audiobooks, altough, reading the book while listening… well, for this I need more time that money. That’s a think I’ll do in future. Soon. So my list is very short: a couple of DVD, the Hobbit of course (hallo, my name is L. and I’m a Oakenshield widow!) and the english version of N&S, twice because the first time the item vanished at the border. What a mistery. Does this include posters and stuff? I think I’m the only fan who doesn’t have a plushie or a Weta etc. Expenses were small when I lived in NY, so maybe $400 if I add DVDs and audiobooks then, but 2 R/T international flights to NY from Mexico for Love, Love, Love ( plus 4 theater tickets) and the cost of Pilgrimage. Also, ordering a Thorin poster sent to Mexico and one received as a gift, plus matting and framing – so I would have to say I’m in for somewhere in the neighborhood about $ 3,000 US. Yep, including everything you paid for that was motivated by your interest in RA 😁. So yeah, living abroad makes it a bit more costly. But I guess we all agree that it was money willingly and happily spent! And I got to meet you. Hiya, late to the party! 😉 I spent about 3000 Euros on Amazon for DVDs, books connected with RA´s work or which he´d been hoped to get a part in, posters, Hobbit books, more Heyer etc. Then a few hundred on his audiobooks or Audio CDs, and most of all flight, hotel, tickets, posters, meals etc. in London for The Crucible, about 1000 Euro (?). Then there´s Stitcher, Digital Theatre etc. But I don´t think that´s all. I´ve been a well-wisher since 2008 when I first saw North&South, but only joined forums, FB, Twitter etc. in 2013. Since then learnt to know a lot of books, other DVDs, a love for GB and most of all people around the world whom I met at their place (or in London) and bought cards or presents for. So the “expenses” for RA stretch in all directions, and filled my life with other things than daily life at home.